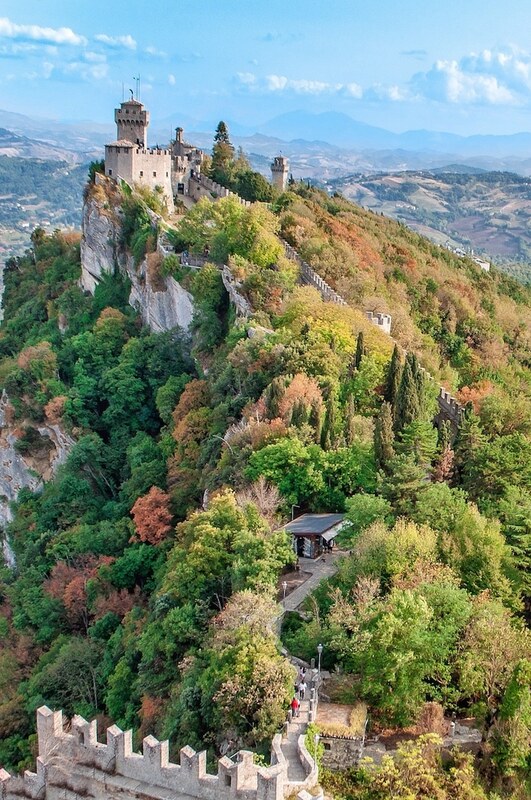 The mysterious mountainous kingdom of San Marino perches precariously on the slopes of Mount Titano. It’s the world’s oldest republic and the third smallest independent European state after the Vatican City and Monaco. But despite its size, there are very many things to do in San Marino. Enveloped by Italy’s Emilia-Romagna and Le Marche regions, close to the Adriatic coast in central Italy, this curious place of towering mountain peaks and castles has a colourful history dating back to AD 301, and yet it is home to one of the world’s most exciting and high-tech sporting events. I travelled to this nation of 34,000 people to see the San Marino MotoGP. While the race day itself fulfilled its thrilling promise, an unexpected bonus of my visit was finding myself in a quirky and enchanting city-state which transported me from the state-of-the-art racing circuit, back in time, to travel this tiny country’s more ancient track. Although just 23.6 square miles, this miniature republic is one of the world’s richest states, having one of the highest rates of Gross Domestic Product (GDP) per head; its wealth no doubt boosted by the more than three million visitors who find their way here each year. I was thrilled to be one of them. 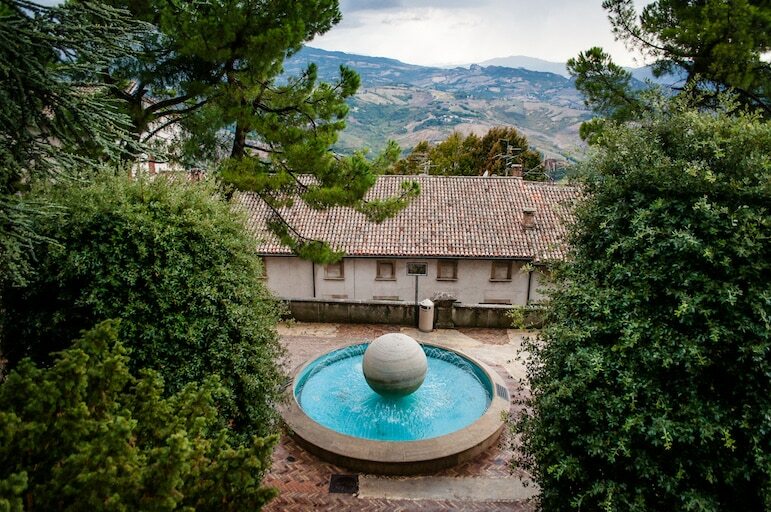 Perhaps one of the best things about San Marino is that, even to a seasoned traveller such as myself, this tiny treasure of a holiday destination remains relatively undiscovered. 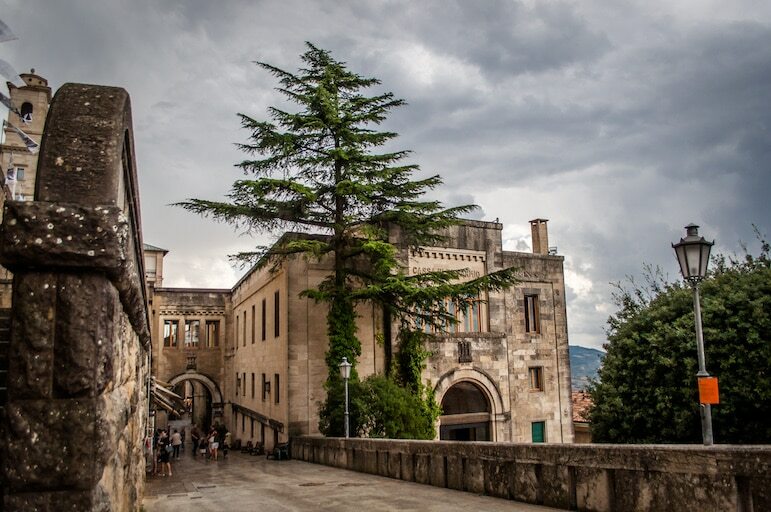 With its colourful and blazing tapestry of ancient history, San Marino may seem a world apart from other European countries. But interestingly for a sovereign state at the heart of Europe, there is no need for foreign visitors to show passports when entering. San Marino has an open border with Italy and shares its language. 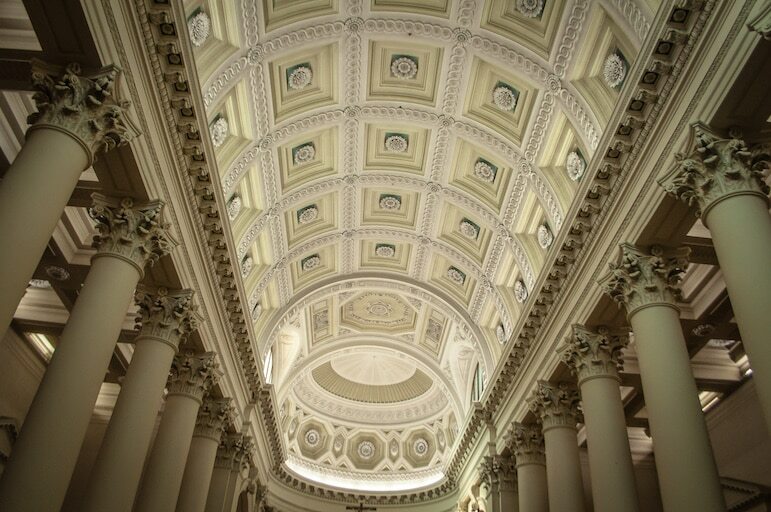 It also shares Italy’s innate sophistication and elegance, which speaks softly of its affluence, rather than shouting it from the tops of its many ornate towers. You might notice the proliferation of banks along its chic streets – banking is a key industry here, which tells you much about its wealthy status. Both its capital, San Marino City and Mount Titano – the country’s highest mountain at 2,480ft above sea level are UNESCO World Heritage sites. 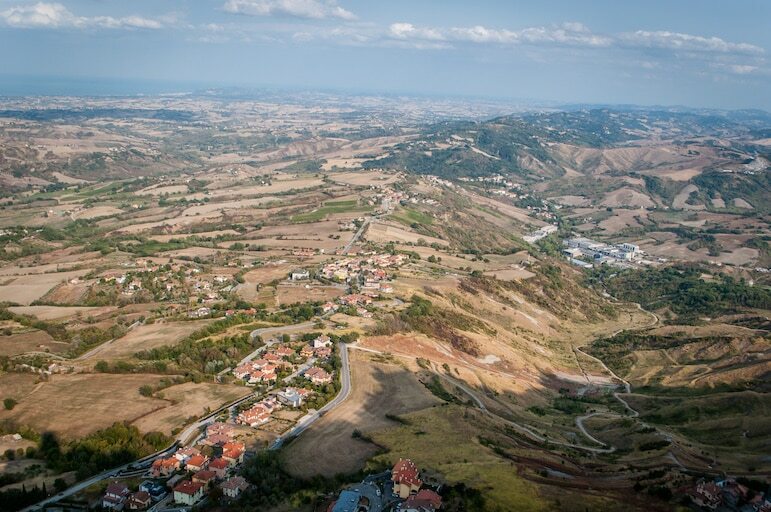 Mount Titano is the highest point of San Marino and a trip to the top rewards with truly panoramic views of the coastal plains below, Rimini – only 30 minutes away by bus, and out as far as the Dalmatian coast. It is also worth noting that San Marino is a haven for duty-free shopping. Its mosaic of pretty streets is lined with boutiques selling watches, perfumes, designer sunglasses and more. Look out for the state’s monuments and squares on its Euro coins. San Marino actually mints its own coins making its coinage unlike any you will see across Europe. 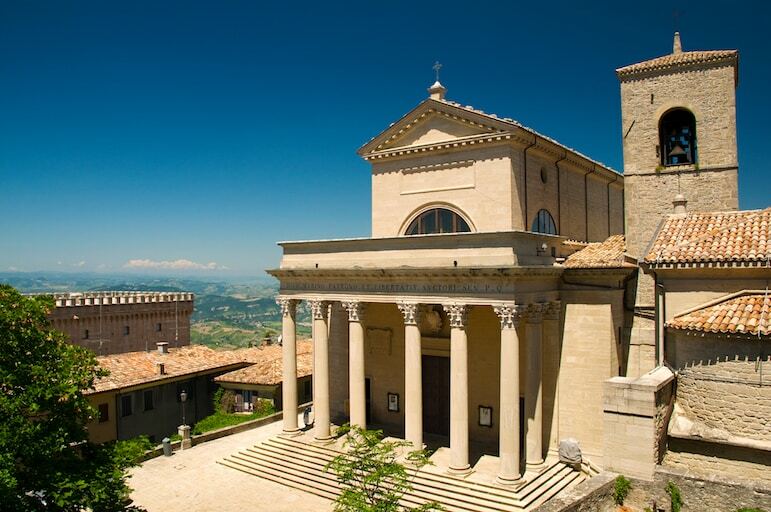 San Marino is so rich in culture and history that you will be spoilt for choice. 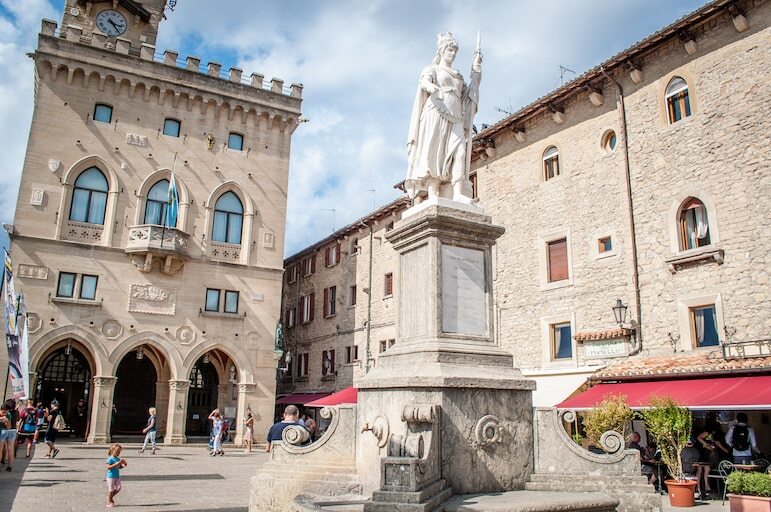 When looking for places to visit in San Marino you should make sure the Piazza della Libertà tops your ‘must see’ list. This city square is intimate, but its surrounding buildings leave you in no doubt as to its importance. 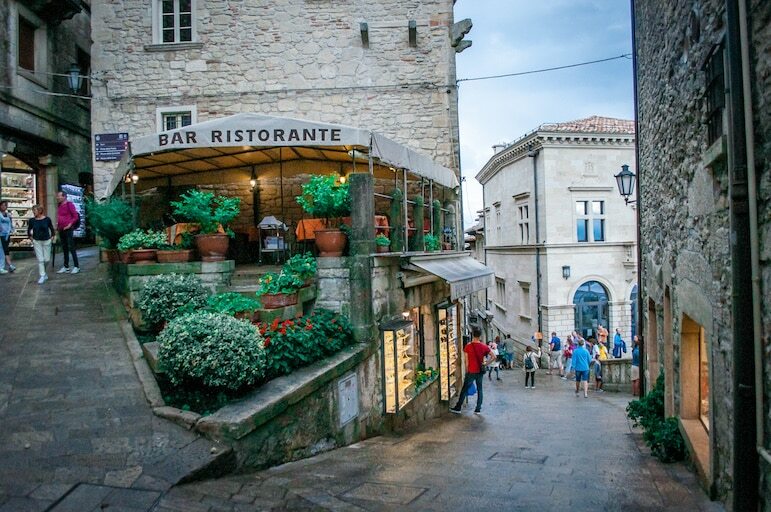 It is also one of the best places in San Marino City to simply sit with a drink and watch the world go by. Sitting out on the pavements at one of the square’s restaurants provides a simple but true pleasure whiling away an hour or so watching both locals and tourists going about their business against the spectacular backdrop of the square’s architecture. 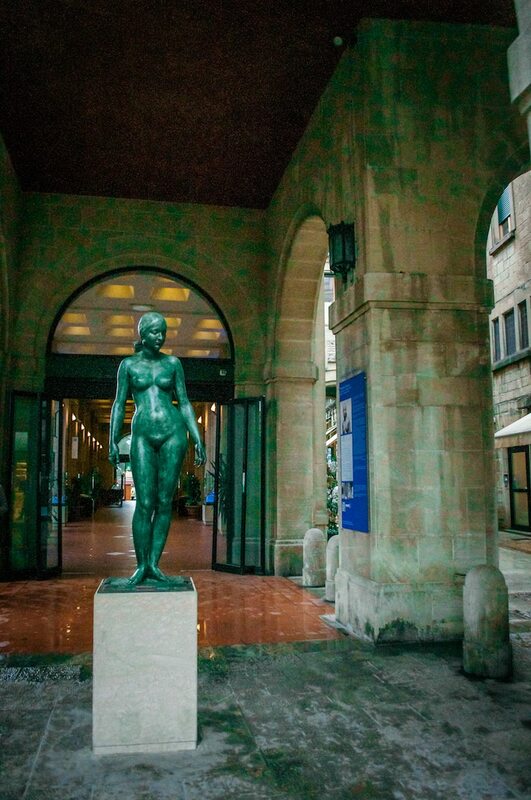 Piazza della Libertà means ‘Freedom Square’ and, aptly, at its centre, is San Marino’s very own statue of liberty – Statua della Libertà, a neoclassical-style monument hewn out of Italian Carrara marble which has been used in building in Italy since the days of Ancient Rome. Beyond the square’s city wall too – looking out across the open rolling countryside – you certainly get a very real sense of freedom. The square is also home to San Marino Town Hall and its official government building, located in the Palazzo Publico. It is definitely worth taking a guided tour, as I did, of this seat of government, which was once a 14th century monastery. The changing of the guard at the Palazzo Publico kicked off our tour. It wasn’t as elaborate or flamboyant as the changing of the guard at London’s Buckingham Palace, but it gave us a glimpse of a long gone, but not forgotten, past, attracting a large and appreciative crowd of onlookers. If you get the chance to go inside the Town Hall you will see it is a splendid building in every sense. Its grand, stately stairway impresses, while the pièce de résistance is the ornate Council Hall. Here the country’s parliamentarians meet to discuss and debate. One unexpected and memorable fact I learned on the tour was that the state’s government made former US President Abraham Lincoln an honorary citizen of the Republic of San Marino, which he gladly accepted, naturally. 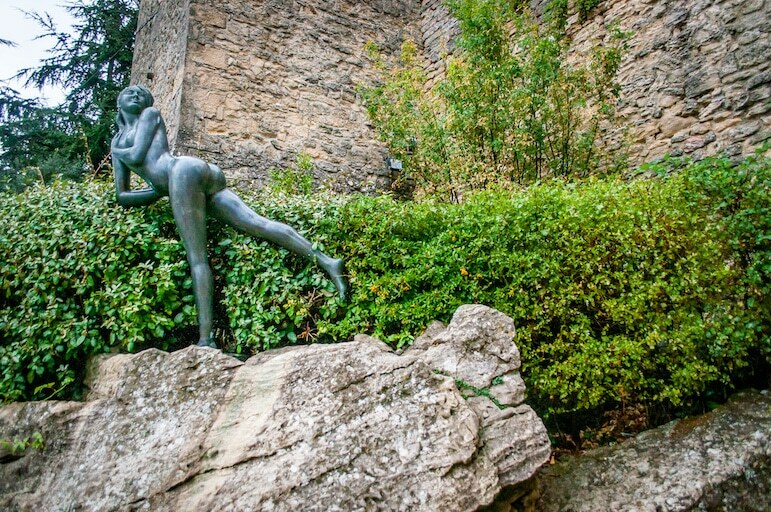 There is much to see in San Marino outside the hallowed walls of the city and its buildings. 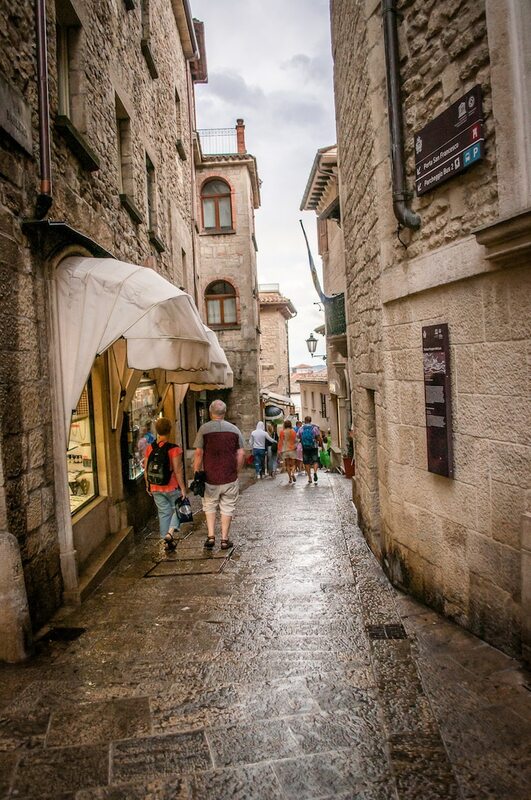 Expect a lot of walking – up and down narrow cobbled streets – if you are to get the most out of your visit. This place is a hilly ‘island’, its boundaries defined by the mountains it sits on, and there is a definite Italian charm in the rise and fall of its winding streets, as well as views at each turn. A part of the Apennine mountain range, Mount Titano dominates San Marino’s landscape with its three prominent fortresses built to defend the republic. They are Rocca Guaita, the most famous of the towering trio on the mountain’s summit, which is flanked by two more – Rocca Cesta and Rocca Montale. These citadels feature in the design of the Republic of San Marino’s state flag. 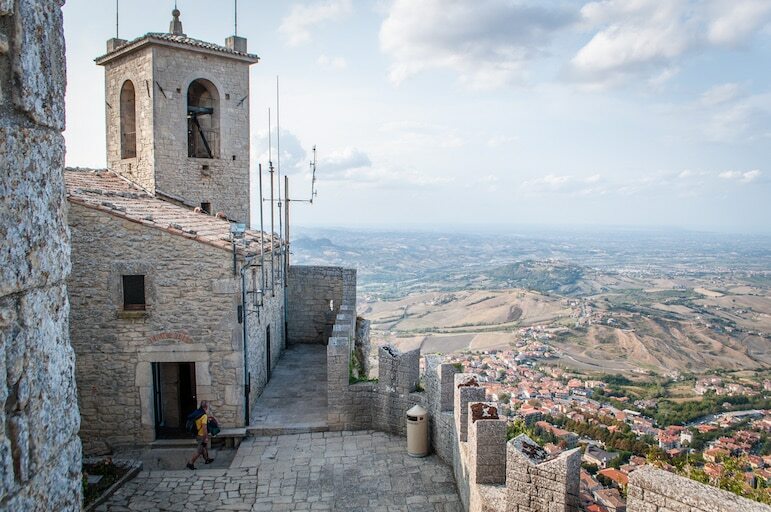 The well-preserved walls and towers of these bastions of the republic are among the best places to go in San Marino. 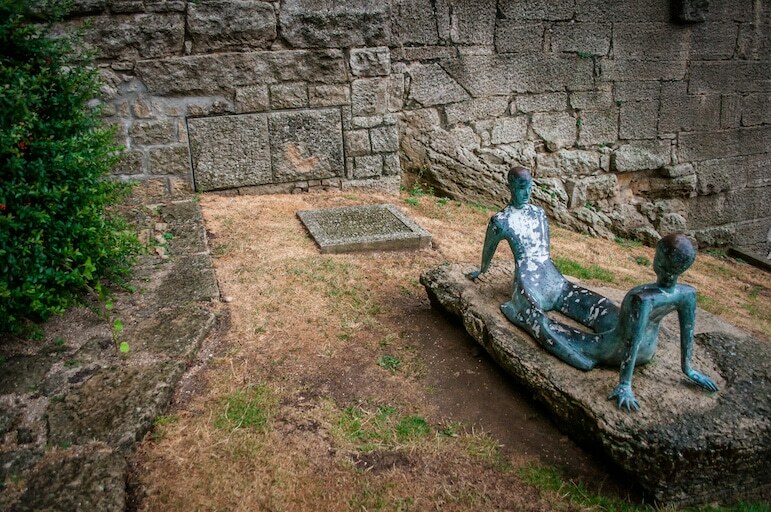 It is possible to visit and tour two of them, Guaita and Cesta. The third tower, Montale, is unfortunately closed to the public. Again, a tour ensures that you get the best from your visit and our local guide, Leonardo, took us up the best route to Rocca Guaita and brought it to life with his stories. Rocca Guaita is the oldest of the towers, being built in the 11th century. We strolled uphill, which was not too challenging, to reach Rocca Guaita, and it was well worth making the effort. 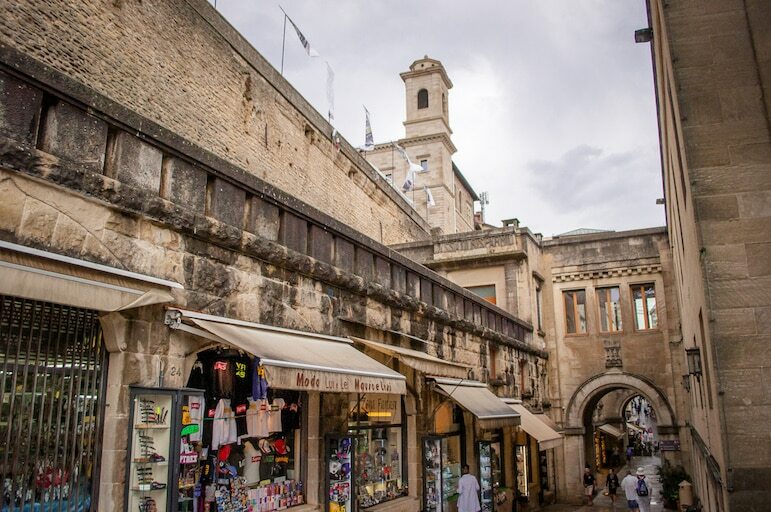 This historic tower has stood guard over San Marino for more than 1,000 years. As I explored its stony yards and ramparts, stumbling across small chapels, it was easy to picture these walls populated by the generations of hundreds of years gone by and imagine the stories – happy and sad, glorious and gory – that had been played out on this ancient stage. The tower came alive around me as I became increasingly fascinated by its eventful past. 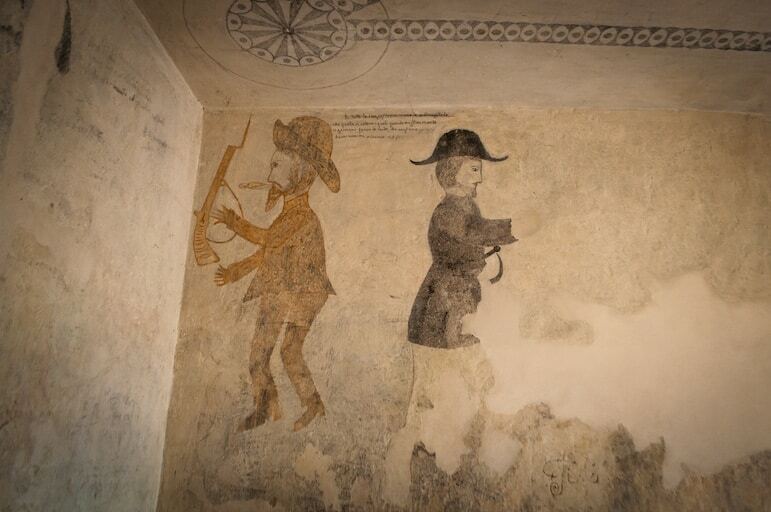 Guaita had served as a prison up until the 1960s and, in one cell, the drawings of a former inmate on the walls suddenly made the tower’s history very real for me. Beautifully preserved self-portraits of one of this cell’s prisoners reminded me that history has a very human face. 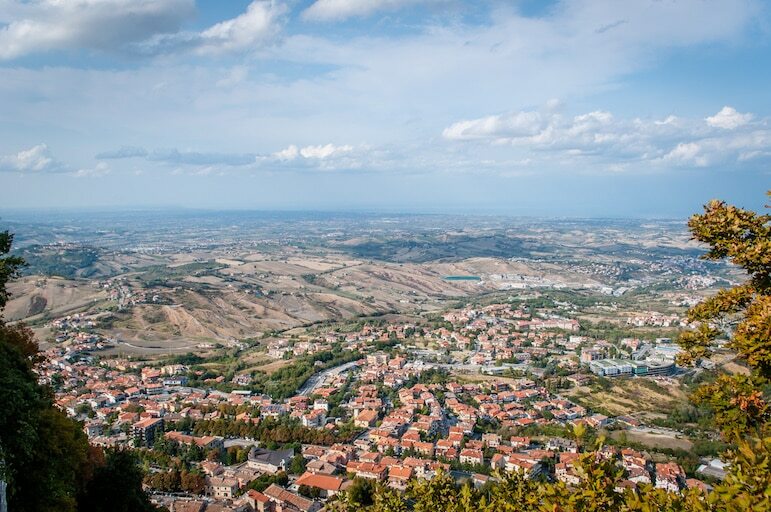 The views over San Marino and beyond, out across Italy, are magnificent. A carpet of cascading villages and small towns stretched out before me. A kaleidoscope of colour faded gently towards the horizon into the soft blue hue of distant hills. 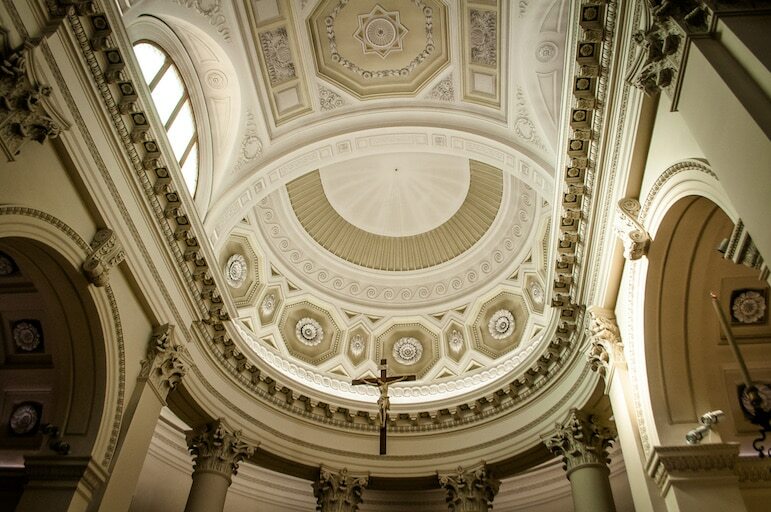 I also visited the beautiful neoclassical catholic church, Basilica di San Marino. There has been a church on this site since the 7th century, although this present one was built in 1836. 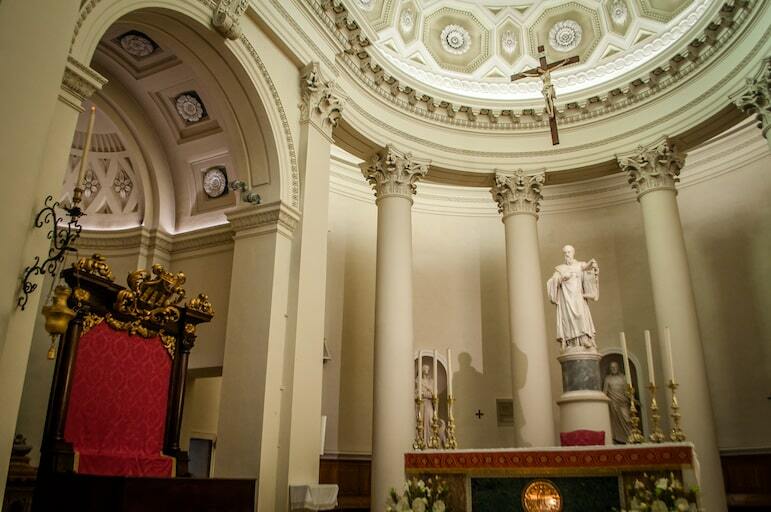 The Basilica is dedicated to Saint Marinus, the founder of the republic. It is a stunning building, magnificent in both scale and location. 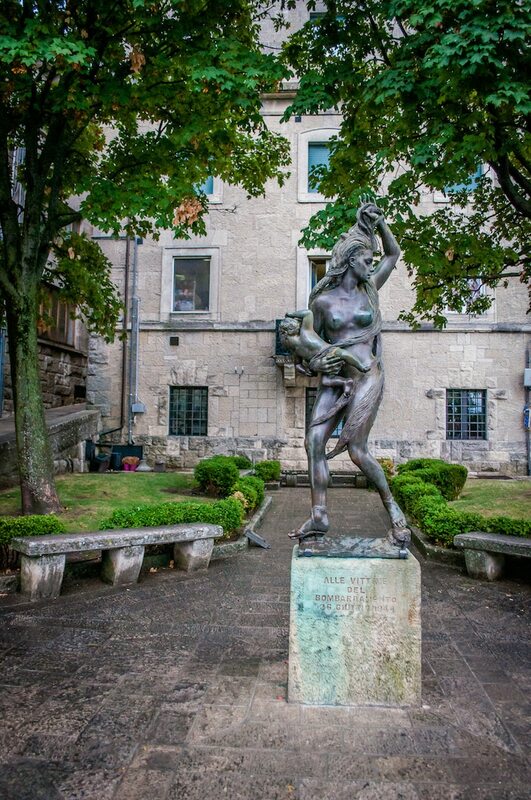 Strolling around the town I was surprised and delighted in equal measure to see an array of public sculptures, liberally scattered around the streets and squares. I have always felt that a society which invests in its public arts is a culturally enriched one. 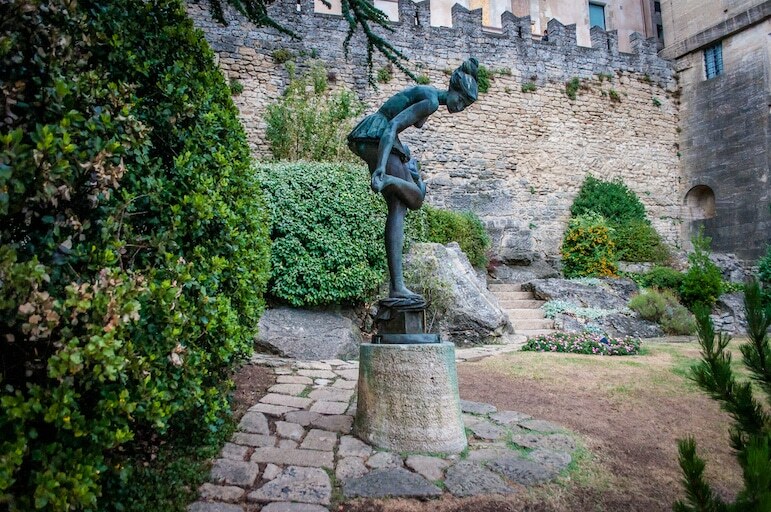 To my way of thinking, these sculptures represent a respectful tribute to the creativity of San Marino’s artistic community, as well as to its people, by celebrating their individual and collective achievements. 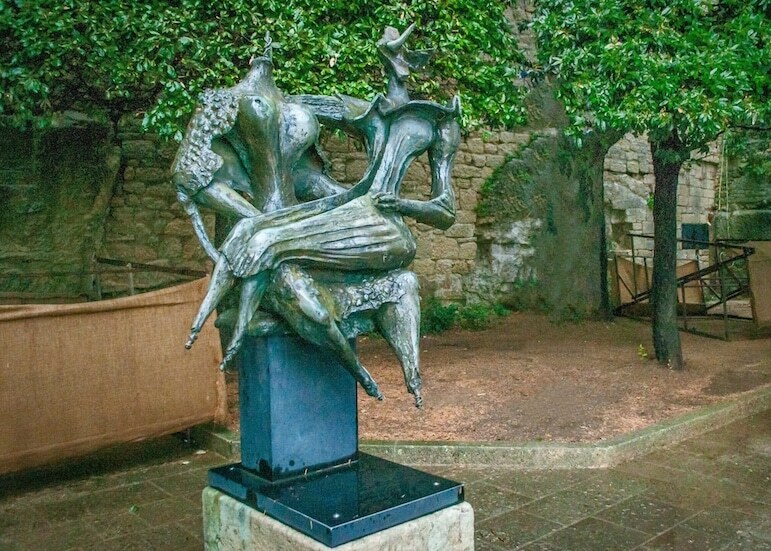 The many sculptures gave the place a real ‘feel good’ factor. Some of the sculptures were of a classical and traditional style, while others were more modern, but all were interesting and decorative. When you stop walking, watching and wondering, and pause for refreshment, you will not be disappointed by the food you can enjoy in San Marino’s restaurants. Like its Italian neighbours, the state takes cuisine very seriously. Having sampled many of the traditional dishes served here, I can assure you that you will be in for a mouthwatering stay. As San Marino is so close to Emilia-Romagna, the influence from this world-renowned food destination – known as the belly-button of Italy for all its stomach-pleasing creations – has crossed over the border into the state, bringing delicious dishes with it such as bolognese ragú, castolette di vitello – bolognese-style veal cutlets, and tarta tre monte – a rich layer cake smothered in chocolate which takes its inspiration from the three towers. A couple of local restaurants that stood out for me were La Terrazza and Hotel Ristorante Cesare. La Terrazza is very traditional in its décor and setting, while the food is first rate. The dessert pictured here was served up at La Terrazza and, in itself, justified my visit to this restaurant. 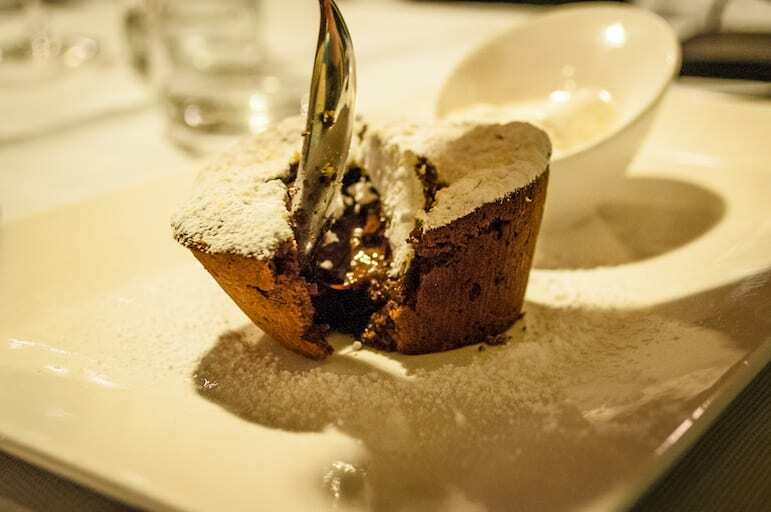 The restaurant at the small four-star Hotel Ristorante Cesare was more modern, however, the food and wine are of equal quality to that of a more traditional eatery. I enjoyed course after delicious course, beautifully complemented by the divine local wines. The majority of San Marino’s home-grown wines are whites, and because it is such a small producer, its wines are saved to be exclusively savoured within the republic making them an even greater find. Though small in terms of its geographical footprint, I never felt bored or restricted during my stay in Europe’s third smallest city-state. 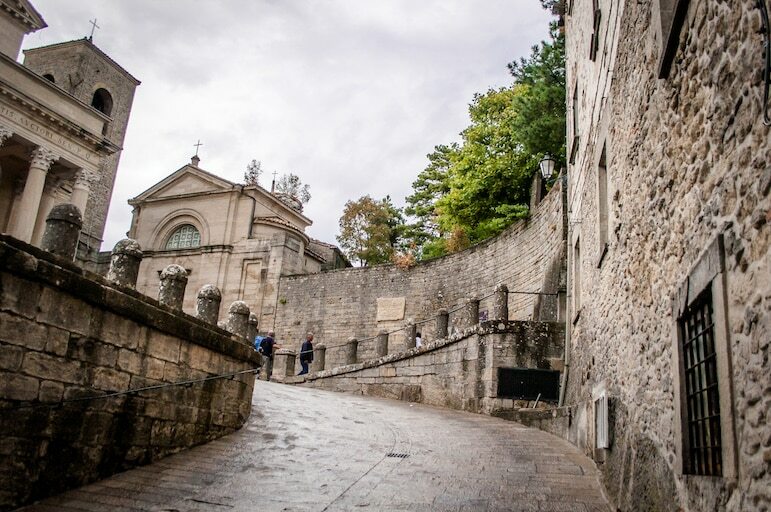 With so many things to do in San Marino, its wealth of grand architecture, breathtaking vistas, fabulous food and wine, I found that I was learning and seeing new things at every twist and turn in this labyrinth of surprises. 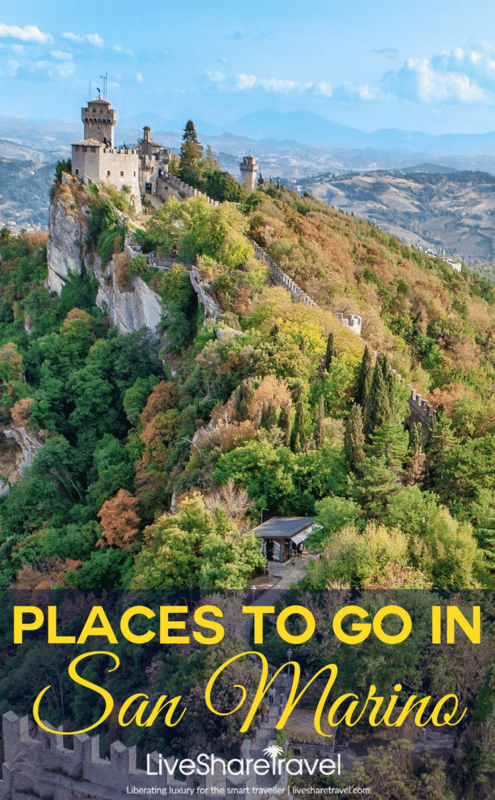 The ease of access into and out of Italy from San Marino is also a real plus. There are some especially lovely quirks which attest to the civility of this small city-state; for instance, it has two sitting presidents at a time, who each serve for just six months. 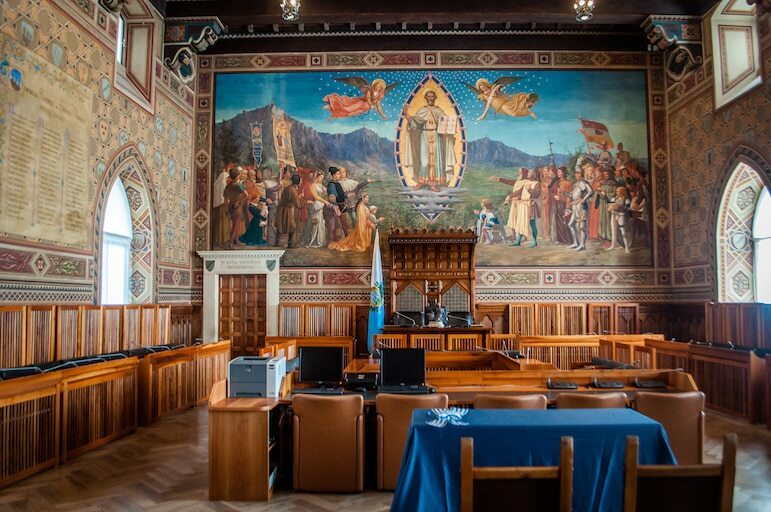 Currently two women occupy those prestigious offices, in fact, San Marino has had more female heads of state than any other country. San Marino definitely won me over with its ancient charm and Italianate elegance. 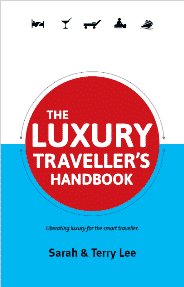 It is a relaxed and welcoming place that’s big on its unique personality, while also benefiting greatly from its Italian influences. 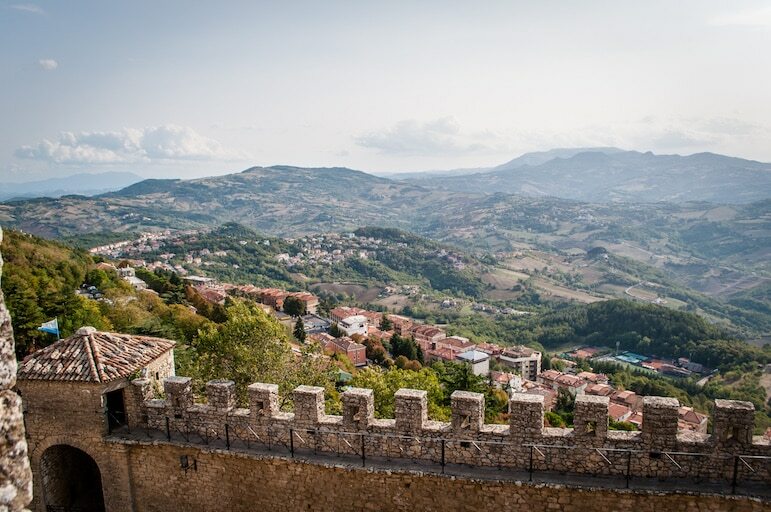 In a world when even holiday destinations can be frenetic and buzzing around the clock, San Marino offers an oasis of calm and gentle courteousness within its ancient ivory towers of Mount Titano. I won’t be waiting for the next MotoGP before I return to this hilly little haven.